Thanksgiving is in a three-way tie for my favorite holiday, with the 4th of July and the Christmas season. I start thinking about it in July, but only allow myself to begin talking about Thanksgiving at the end of October. I didn’t always love Thanksgiving, though. I actually kind of dreaded it. Sometime in the early ’90s, my parents were fed up with rotating between families and locations. They told everyone that they were having Thanksgiving at home – anyone would come, but they didn’t want to go anywhere. Expecting a quiet Thanksgiving at home, we were all quite surprised when almost everyone both sides of the family joined them – probably around 30 people. My parents hosted Thanksgiving for the next 15 years. My mother was many amazing things, but she was not a natural hostess. While she loved being around people and had a large community of friends, having people over for dinners and parties made her stressed and anxious, which in turn made the rest of us stressed and anxious. I think Thanksgiving freaked her out the most, resulting in a little fighting and a fair bit of tension, which made me ambivalent about the holiday as a kid. It seemed like so much work. The year after my mother passed away, my father, sister and I decided to keep the tradition of hosting Thanksgiving. I was really nervous because almost two decades of watching my mother freak out about Thanksgiving had hardwired me to think the holiday was a herculean challenge. So to calm my fears, I planned (some might say over-planned, but that’s relative). I pulled together all my mom’s recipes, which were free-floating in a file in her filing cabinet. Sometimes I found more than one version for the same dish. For example, I found three recipes for sweet potatoes: one in my grandmother’s handwriting, one in my mother’s, and one typed (the one she finally started making in the mid ’90s that does not include marshmallows and corn syrup, and is still requested yearly by the entire family). I scoured magazines and websites for planning advice. and committed the planning checklists from  and  to memory. In one spot on the counter, I had a pile of paper that I thumbed through constantly the days leading up to Thanksgiving: several different checklists (two from Real Simple – one online and one in the magazine – and one from Martha Stewart, plus a few others I had found in other magazines) plus all the recipes. It was a bit of a mess, especially once I started cooking. But I took notes of what I actually did, which involved cooking a little every day starting the weekend before. Thanksgiving morning, I woke up nervous, unsure how the day would unfold. At noon, my dad, sister, and I stood staring at each other with nothing to do until the guests arrived… in another two hours. It was an eerie feeling, because usually we were scrambling until the last-minute and squabbling with each other. It ended up being an enjoyable, (relatively) stress-free day. And from then on its been one of my favorite holidays, because (most of) the stress is gone and it’s just about food and family. It’s still bittersweet because I wish my mom was there, but we think about her a lot when we jokingly reminisce how stressful all those Thanksgivings were. She’s definitely there in spirit. In the five years since I took over Thanksgiving, I have finessed my system. 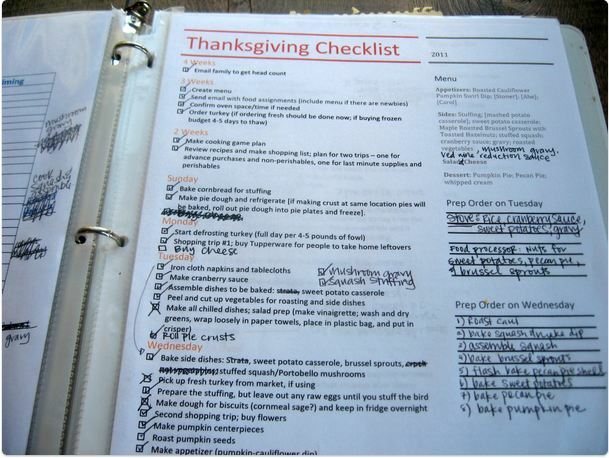 Central to keeping things organized is my Thanksgiving binder, which houses my timeline, checklist, and recipes. The binder has two sections: My prep worksheets and the recipes. I took several different planning guides and checklists and merged them into one (see link to pdf, below). I also create a dish overview to have a more general idea of everything that needs to be cooked and when. I use the MacGourmet software to house all my recipes. It has a cookbook builder, which I use to print all of my Thanksgiving recipes. You can choose to print the recipes by course (e.g. appetizer, dinner, dessert, etc.) or by order of preparation – whichever works best for you. A great feature of this program is that you can create shopping lists by dragging recipes into it. What’s useful about this is that it combines amounts of ingredients across recipes, easier than calculating amounts by hand. They have a free trial, so worth checking out if you have a Mac. I’m sure there’s comparable software for PC’s, let me know in comments if you have a good suggestion. I put the recipes in sheet protectors –  a lesson I learned after that first year, because it keeps them from getting completely soaked or covered in food. I also keep post-its and a pen handy in the binder to write notes – what worked, what didn’t – so that I can improve next year. I try to update the binder the week after Thanksgiving – otherwise I suffer from T-day amnesia and don’t remember what I did. I’ll be honest, Thanksgiving is still not without its stresses, squabbles, and snafus (I’m sure my sister and dad would agree). However, having this system has made me a firm believer that with good planning Thanksgiving can be really enjoyable. That’s why it turned from one of my least-favorite holidays to one of my most. Read the rest of the post and download the timeline and checklist pdf here.